available in two sizes: 17.5" x40" or 26.5" x 60"
Few natural subjects captivate the human imagination like the tropical Rainforest. Visions of Waterfalls and tropical vegitation waving in the breezes of a moonlit island sky. David Miller captures the serenity of the Rainforest and it's many Waterfalls in breathtakingly brilliant color. The mist of the Waterfall encapsulates the surrounding vegitation and causes the Rainforest to burst forth with vibrant life. David miller has mastered the techniques that bring fantastic Rainforests and Waterfalls from his imagination to the canvas. 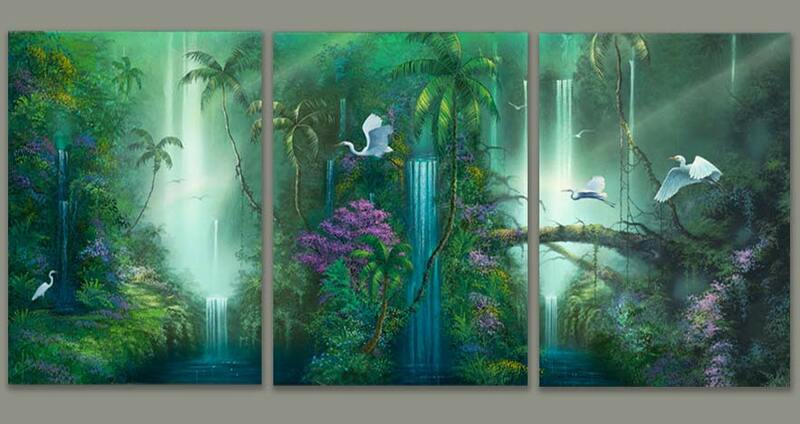 Enjoy your own personal Rainforest of life or serene Waterfall with one of David Miller's masterful works.